Development of protocols for greenhouse production of seedling transplants of seabeach amaranth will create opportunities for North Carolina growers to produce transplants that can be sold to the Federal Government and to private companies engaged in beach restoration projects in states where the species has disappeared or is currently threatened. North Carolina growers are strategically located to produce and market seabeach amaranth for the coastal communities along the entire eastern United States. Seabeach amaranth is an interesting summer annual that grows at the bases of sand dunes along beaches of the U.S. Atlantic Coast. Historically, its range included nine states from Massachusetts to South Carolina. However, it no longer occurs on beaches in Massachusetts, Rhode Island, New Jersey, Delaware, Maryland, and Virginia. It is presently found on scattered beaches in New York, North Carolina, and South Carolina. As a result, it is currently listed as “threatened’ by the U.S. Fish and Wildlife Service. For several reasons, the Federal Government is extremely interested in restoring this species to areas where it once grew. One reason is that it traps sand on the beaches, playing a role in the initial stages of the development of sand dunes. The plant is also viewed as a “barometer” that serves as a means to evaluate the vitality/vigor of the beach ecosystem. Also, beach restoration/sand renourishment projects have created a demand for transplants of seabeach amaranth, which are currently unavailable. Demand in turn has revealed the need to develop greenhouse protocols for propagation and culture of the species as well as opportunities for growers to profit from sale of these plants. Therefore, the following research was conducted with two objectives: 1) investigate the influence of stratification (moist-prechilling), temperature, and light on seed germination of seabeach amaranth; and 2) study the influence of substrate, substrate pH, and nitrogen (N) fertility on growth of the species. Seed Germination: Seed capsules of seabeach amaranth were collected from plants growing on Oak Island, N. C. on September 29, 2002. The capsules were transported to Raleigh and dried at 70°F. From October 7 to October 11 the seeds were extracted, cleaned, and stored at 70°F. On October 17, 2002, seeds were graded and 100 seeds were placed in each of 80 glass petri dishes with each dish containing two prewashed (soaked) germination blotters moistened with tap water. The dishes were then placed in the dark at 39°F for stratification of 0, 30, 60, 90, or 120 days. After a particular stratification interval, 16 randomly selected petri dishes were removed from stratification and randomized within two seed germinators, one located in the Department of Horticultural Science and maintained at 77°F and the other located in the North Carolina State University Phytotron and maintained at an 8/16 hr thermoperiod of 86/68°F. Within each temperature regime, seeds were subjected daily to photoperiods of 0 (total darkness) or 16 hr. The 16 hr photoperiod at 86/68°F began with the transition to high-temperature portion of the cycle. The seed germinators were equipped with cool-white fluorescent lamps to provide a photosynthetic photon flux (400-700 nm) of ≈ 40 µmol.m-2.s-1 (2.8 klx). The constant darkness treatment was maintained by keeping the dishes in black sateen cloth bags during the germination period and all watering and germination counts were performed in a darkroom using a green safelight. Germination blotters were kept moist with tap water throughout the duration of the experiment. For each temperature, all photoperiod-stratification treatments were replicated four times with a replication consisting of a petri dish containing 100 seeds. Germination and decayed seed counts were recorded every 3 days for 30 days. Seeds were considered germinated when radicle emergence was greater than or equal to 0.04 in. Seeds were removed from the dishes once they germinated or were judged to be decayed. Data were subjected to analysis of variance procedures and regression analysis. Greenhouse Culture: This study was a 2 x 4 x 4 factorial in a randomized complete block design with four replications (total of 125 containers). The treatments were two substrates (pine bark based or peat based), four rates of dolomitic limestone (5, 10, 15, or 20 lbs dolomitic limestone/yd3), and four rates of N (0, 100, 200, or 300 mg/L). Nitrogen was provided by Peters 20-10-10 plus minors (Grace/Sierra, Fogelsville, Pa.). Seeds that had been stratified for 90 days were surface sown directly into containers (vol. = 169 cm3) on June 16, 2003. Plants were irrigated every other day with a N solution beginning July 4, 2003. At harvest (August 7, 2003), tops were removed and roots were washed free of substrate. Tops and roots were dried at 160oF for 3 days and weighed. All variables were tested for differences using analysis of variance procedures. Regression analysis was used, where appropriate. Seed Germination: Data indicated that freshly harvested seeds of seabeach amaranth have physiological dormancy which can be removed/broken by stratification. Without stratification, the seeds will not germinate. Results also indicated that contrary to a previous report, the seeds do not have an obligate light requirement. However, greater germination will occur for seeds exposed to light. Following stratification at 39°F, for 90 days, germination of 80% was achieved by placing seeds at an 8/16 hr thermoperiod of 86/68°F with a daily 16 hr photoperiod. Interestingly, germination at 77°F was negligible regardless of stratification and photoperiod. Greenhouse Culture: Data indicated there were no differences in seedling growth between a peat based substrate and a pine bark based substrate. So growers can successfully grow seabeach amaranth in either substrate. This allows a grower some flexibility in selecting a substrate. 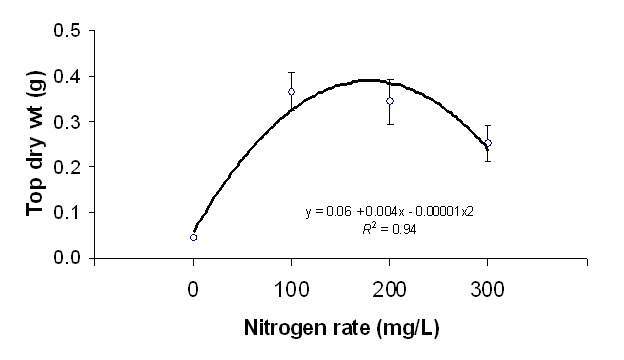 Nitrogen rate for maximum top and root growth was 180 mg/L and 170 mg/L, respectively (Figs. 1 and 2). It is very encouraging that both tops and roots have similar responses to rate of N. Even though the soil pH where seabeach amaranth grows in its native habitat is very high (7.8), in soilless substrate both tops and roots performed best when the substrate was amended with 5 lb/yd3 of dolomitic limestone (Figs. 3 and 4). 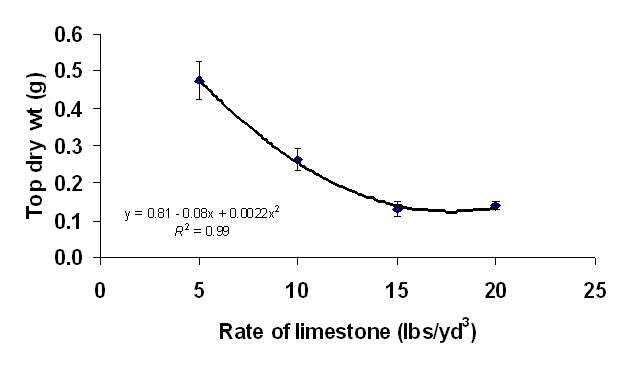 This rate of limestone resulted in a pH of » 6.0. This is similar to the requirements of other bedding plants. It is possible that the optimum substrate pH could be even lower as we did not investigate lower substrate pH. Results indicate that seedling transplants of seabeach amaranth can be produced in 7 to 9 weeks following sowing of seeds stratified at 39°F for 90 days. Greenhouse production of seedling transplants of seabeach amaranth appears feasible based on research conducted in 2003. Growers can use either a pine bark based or peat based substrate. 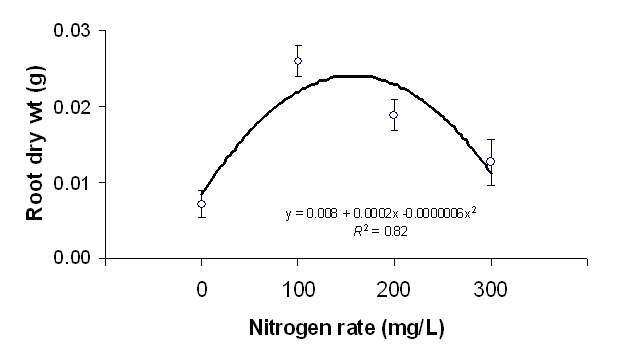 Nitrogen rate for maximum growth is 175 mg/L. A substrate pH of 6.0 produced a healthy plant. Seabeach amaranth can be produced in 7 to 9 weeks following sowing of stratified seeds. It would be, however, difficult to provide these recommendations to growers with a high level of confidence based on one study. Therefore, additional research is necessary for development of a complete protocol that a grower would need to be successful. A manuscript dealing with the seed germination research is currently in preparation for submission to a peer-reviewed journal. Fig. 1. Top growth of seabeach amaranth in response to N rate. Each symbol is based on 48 observations and vertical bars = ±1 SE. Fig. 2. Root growth of seabeach amaranth in response to N rate. Each symbol is based on 48 observations and vertical bars = ±1 SE. Fig. 3. 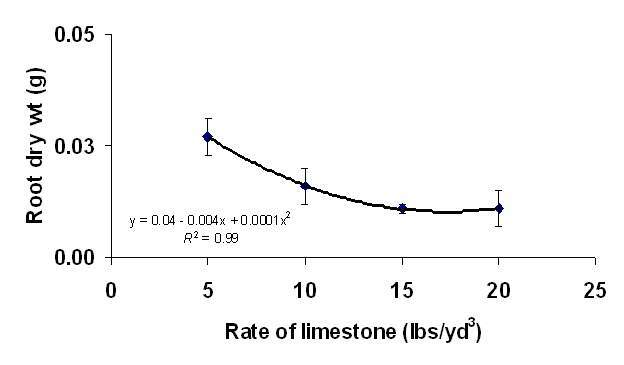 Top growth of seabeach amaranth in response to limestone rate. Each symbol is based on 48 observations and vertical bars = ±1 SE. Fig. 4. Root growth of seabeach amaranth in response to limestone rate. Each symbol is based on 48 observations and vertical bars = ±1 SE. • Does Your Lawn or Garden Need Lime?